Secretary-General Ban Ki-moon addresses journalists at United Nations Headquarters. Secretary-General Ban Ki-moon today said that he would convene in Geneva on 22 January the long-sought international conference on Syria bringing together the Government and the opposition to a negotiating table for the first time since the conflict started in March 2011. “This is a mission of hope,” Mr. Ban said addressing journalists at the United Nations Headquarters in New York. Mr. Ban called the upcoming conference, known as “Geneva II”, a “vehicle for a peaceful transition” that fulfills the legitimate aspirations of all the Syrian people for freedom and dignity, and which guarantees safety and protection to all communities in Syria. The goal of Geneva II would be to achieve a political solution to the conflict through a comprehensive agreement between the Government and the opposition for the full implementation of the Geneva communiqué, adopted after the first international meeting on the issue on 30 June 2012. The communiqué, which has been endorsed by the UN Security Council, lays out key steps in a process to end the violence. Among these, the establishment - based on mutual consent - of a transitional governing body with full executive powers, including over military and security entities. He added that it would be “unforgiveable” not to seize this opportunity and reiterated that the conflict remains “the world’s greatest threat to peace and security” which can only be solved through political means. In addition, it continues to send tremors through the region and has forced unacceptable burdens on Syria’s neighbors, he stressed. Mr. Ban urged all parties to begin working now and take steps to help the conference succeed, “including toward the cessation of violence, humanitarian access, release of detainees and return of Syrian refugees and internally displaced to their homes”. The UN chief expressed his “profound gratitude” to the initiating states, the Governments of Russia and the United States, as well as to other Member States and to the Joint Special Representative of the UN and the League of Arab States, Lakhdar Brahimi. 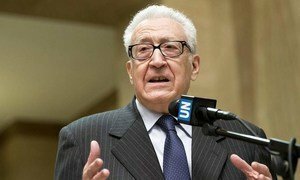 The proposed Geneva II conference to find a political solution to the Syrian crisis must include representatives from the Government as well as the opposition, the Joint Special Representative of the United Nations and the League of Arab States, Lakhdar Brahimi, told a news conference in Damascus today.